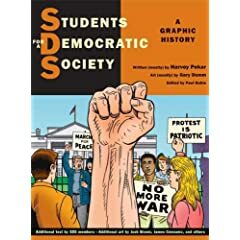 Students for a Democratic Society is a book I have been anticipating for several reasons since I first heard it would be published. First, Harvey Pekar is a huge reason I became a comics fan. Second, I love historical and biographical graphic novels. Third, I wasn't very familiar with the Students for a Democratic Society or their political or social agendas. Students for a Democratic Society is divided into two parts. Harvey Pekar and historian Paul Buhle walk us through the history of the SDS at the beginning of the book. The second part is where the book shows its exceptional sense of history as participants in the cause share their own personal stories, bringing personal perspectives that band together to form a strong narrative on their own. My next book is Michael Pollan's In Defense Of Food: An Eater's Manifesto.